Here’s the barn with the new milkhouse extension, doing fine. We were slightly concerned that the slope of the new roof might be too shallow for snow to slide off, particularly with roll-off from the roof of the barn. 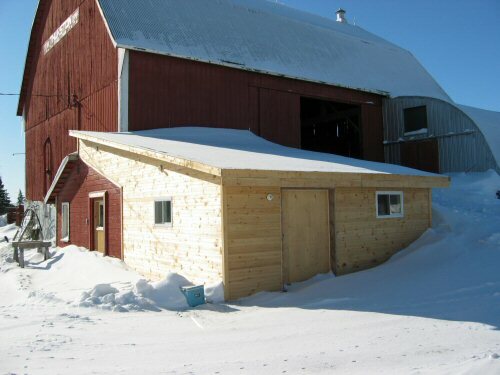 The starting point was determined by an existing heavy cross beam in the barn, while the next beam is halfway up the wall – sloping the roof from there would’ve required tons of extra work and materials. As it is, it seems to be working out. Not having much snow or much of a winter at all helps. I doubt the sky will be falling in!